The L.A. Unified School District and United Teachers Los Angeles have reached a tentative agreement on a new contract. There will be plenty of analysis from all quarters on the details in the days and weeks to come, but for now we can all agree on one thing. The strike had to happen because without it, the district would not have made the concessions it did. 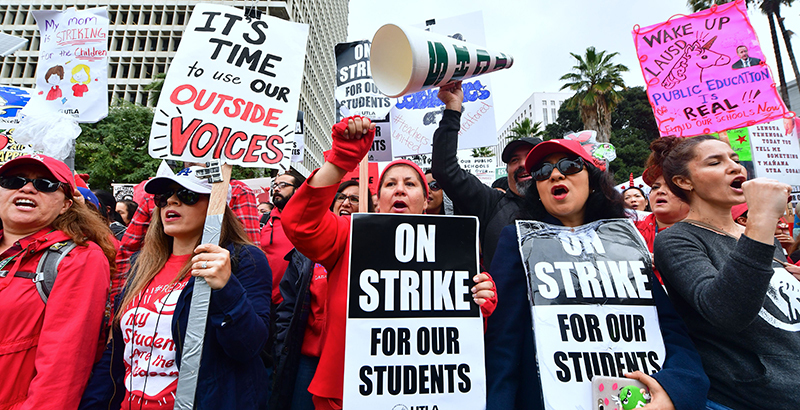 What made that happen wasn’t the direct effect of the strike on Superintendent Austin Beutner and the school board, but on L.A. Mayor Eric Garcetti, the county office of education, Gov. Gavin Newsom, and the state legislature. L.A. Unified’s finances are a legitimate mess, so what Beutner needed was reassurance that the city, county, and state wouldn’t let a more generous deal sink the district. Persuaded that there would be no takeover of the district and that proposed money in the governor’s budget will become actual money, Beutner bent far enough to reach an agreement. The strike had to happen because the union was not going to accept a deal without one. The strike had been in the works for more than two years, even though career educator Michelle King was superintendent. The union invested lots of money and staff time into ensuring the rank and file supported a strike. The authorization vote was overwhelming. Agreeing to anything less than a perfect deal prior to a walkout would have led to internal union turmoil. Had this exact tentative agreement been offered two weeks ago, the union would have rejected it. The union brought pressure through marches, rallies, and the fact that 80 to 85 percent of students stayed home. Teachers lost 1.5 to 3 percent of their pay during the strike, depending on whether you compute it for a calendar year or a school year. Students lost six days of instruction — and probably a bit more, since it will take some time to get things back to normal. All parties have declared this a victory and will devote considerable resources to promote that view with the public. It may well turn out that way, if the economy continues to grow and tax revenues don’t falter. If there is a downturn or a recession, or even a continued decline in enrollment, the rosy assumptions that made this deal possible will weigh like an anchor on district operations and staffing. All those teachers, counselors, and nurses who are about to be hired will be the first laid off, thanks to seniority provisions. To avoid that, union members may have to make considerable financial sacrifices. Regardless of the way it pans out, both union president Alex Caputo-Pearl and (probably) Beutner will be elsewhere by then. A new group of people will have to hash out future disputes, and we can all pretend that this month’s events didn’t lead us there.